Today, we are experiencing a global food crisis. Close to one billion people have to cope with hunger, and many more have to deal not only with the malnutrition that stems from lack of food, but also from the one that derives from eating too much junk food. This latter form of malnutrition is promoted to a large extent by food corporations that have discovered the human love of sweets, a love that is close to an addiction for many people. As a result, now 2.1 billion people world-wide are overweight and according to The Lancet, a leading medical journal, this represents an “obesity time bomb” that endangers the future health of people around the globe, and also threatens to bankrupt most health care systems. In Let Them Eat Junk: How Capitalism Creates Hunger and Obesity, I explore many dimensions of a set of global food problems that are reaching crisis proportions. For example, it is now common for commentators to refer to a “global obesity epidemic.” While this awareness is a good thing, I wish more attention were paid to the “global hunger epidemic”, even though many people take this as simply the way things have always been. But should we really accept that the underlying cause of one-third of all child deaths under five is malnutrition, and that, according to estimates by the World Food Program, 16,000 children around the world die each day from hunger-related conditions? Even in rich America over 45 million people live in poverty. Further, 20 percent of all American households are dependent on food stamps, including 22 million children; yet Congress cut the food stamp program by 7 percent in 2014. It did this despite the shocking growth of poverty that caused US households dependent on food stamps to increase by 52 percent in the past 5 years. Hunger and obesity on a global scale are very large problems to analyze within a short article. Hence, I will narrow it down to one topic: US corn production and distribution. The US produces 40 percent of the world’s corn harvest, placing it far ahead of other countries, but it only exports about 15 percent (exports to Mexico of US subsidized corn have devastated Mexican corn farmers). 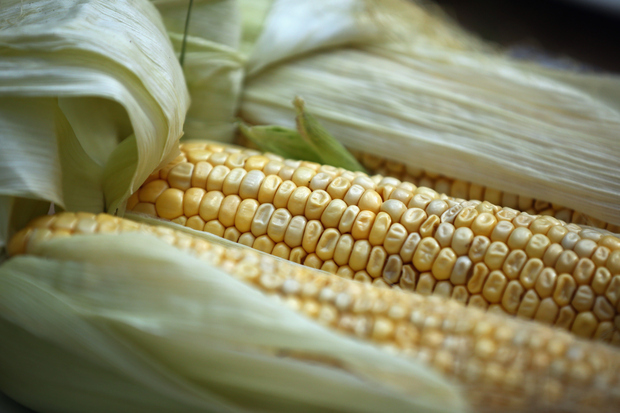 Though corn can be a healthy food, in the US very little is consumed directly as a part of human nutrition, for over 40 percent is converted into ethanol in order to feed cars, while 36 percent is used as feed for livestock—it takes 425 gallons of water to produce 4 oz. of beef—which in turn becomes meat for human consumption, and much of the rest (other than exports) is converted into high fructose corn syrup (HFCS), the main sweetener of most junk food and a major contributor to ill health: diabetes, heart attacks, obesity, fatty liver disease, etc. On average American children get 20 percent of their calories from HFCS. Having discovered long ago that most humans have a “sweet tooth”, the food industry now adds HFCS to most processed foods (74 percent of packaged foods). Research published over a year ago in the journal “JAMA Internal Medicine” argues that people who consume 25 percent or more of their daily calories from added sugar nearly triple their likelihood of dying from heart disease. Further it has been known for years that the high intake of added sugar can be a causal factor in cancer, diabetes, fatty liver disease and many other chronic diseases. On the one hand, the US government gives large subsidies to the corn industry, while on the other, the USDA (US Department of Agriculture) claims that healthier diets would save $75 billion a year in medical expenses which now include 16 million Americans with heart disease, 25.8 million with diabetes, and 31 percent with fatty liver disease. The production of HFCS typically uses about 5 percent of the total US corn crop, and, as already pointed out, 40 percent goes to ethanol. 90 percent of the corn crop is genetically modified to be immune to herbicides, the active ingredient of which is “glyphosate.” This is highly problematic given that even the conservative WHO (World Health Organization) has stated that it is probably a carcinogen. Furthermore, weeds have in time built a resistance to glyphosate so that more and more has to be used to kill what are becoming superweeds. Finally, as more people get exposed to more glyphosate, they manifest a variety of diseases. For example, in Argentina, in places where glyphosate is widely used, birth defects have gone up fourfold. A recent study by an MIT scientist claims, that in combination with other chemicals, glyphosate is a causal factor in autism spectrum disease, and that at current rates 50 percent of Americans will be autistic by 2030. According to existing legislation, the US is planning a four-fold increase in corn biofuel by 2022, and all of this corn will be GM. US subsidies for food and farming over the next ten years come to nearly $1 trillion. In 2012, 283 million lbs of glyphosate (mostly produced by Monsanto as “Round Up”) were dumped on American corn fields, and this will steadily increase with the greater acreage of biofuel corn and with the growing resistance of weeds to this herbicide. Further, as more and more acreage is converted to highly subsidized corn destined to be biofuel, the prices of other crops and hence of food in general will increase as their supply decreases and the supply of corn for biofuel increases. At the same time as more corn is grown for biofuel and less for food, the prices of foods based on corn will increase. It has already been estimated that this was the main cause of an increase in the price of food in recent years. For example, corn prices increased by 21 percent in 2009 as a result of the use of corn for biofuels. The short-term profit orientation of most capitalist practices is radically inadequate when it comes to dealing with long-term social and environmental costs. It gets us into trouble by ignoring the most important variables when it comes to the future quality of the environment and of life, which are, of course, thoroughly intertwined. One way forward would be to collect all the profits generated by capitalism and then redistribute them in accord with criteria that advance long-term human and environmental flourishing while reducing social and environmental costs. This would require a transparent economy and new democratic institutions that would include expertise, practical experience, and people most impacted by the particular economic arrangements. Food could increasingly be supplied by ecologically friendly means informed by advanced studies in ecology as well as by practical knowledge gained at local levels. Farms could mostly be run by cooperatives, families, or communal forms of organization. Last but not least, it could increasingly be understood how much health depends on a healthy diet, how much all human flourishing is integrated with environmental flourishing, and how much the food system needs to be part of this integration. Robert Albritton is Professor Emeritus in the Department of Political Science at York University, Toronto, Canada. He is the author of various books, such as, most recently, Economics Transformed: Discovering the Brilliance of Marx (2007) and Let Them Eat Junk: How Capitalism Creates Hunger and Obesity (2009).